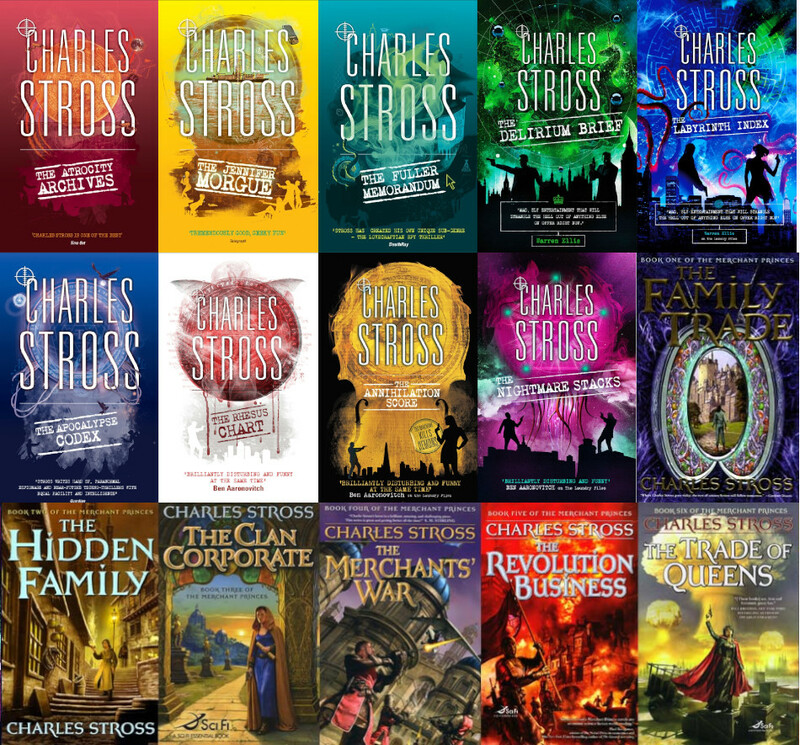 Charlie Stross (previously) has spent most of his career writing two very long-running series: The Laundry Files, a Cthulhu-tinged series of spy procedurals, like HP Lovecraft writing James Bond, except Bond is a sysadmin; and The Merchant Princes, a tricksy medieval high-fantasy story that's actually an alternate worlds story that's actually a primer on economics, totalitarianism, mercantalism, and theories of technological progress. Both series have been going for more than a decade, both run to more than a million words, and both have been periodically interrupted while Stross managed both the writing process and personal drama and trauma. Writing this kind of longrunning tale is a rather extraordinary thing to do -- though it may seem like the world is full of longrunning series, the commercial reality of this kind of thing means that a large number of trilogies (or more) die after the second book, because the normal trajectory of a series to lose readers with every installment, leading to a death spiral. Stross has been at this long enough, and is also reflective enough, that he has come up with some really fascinating insights on this process, of going from being a young writer to a middle-aged writer while telling a single story, for years and years and years, and having the story, the writer, and the world all change under you while you're at it. One observation about something that's missing from Stross's otherwise excellent piece: for critics and reviewers, series can be really hard sledding. I get a lot of books to read, blurb and review -- about one hundred times more than I could possibly manage. I really dote on Stross's work and generally migrate it to the top of the pile when it comes in, but there are times when I just have to miss a book, because of some combination of other books that have come in (for example, a debut by a promising newcomer, maybe a former student, whose career might live or die on the basis of the critical reception for their first novel) and life circumstances (finishing or touring a book of my own, fighting over the EU Copyright Directive, etc). Missing a single book by a writer who does standalone novels isn't critical -- you just pick up the next book and review that one. But with a series, missing a single volume generally means sitting out the rest of the series. That's bad enough when it's a trilogy, but with something like the Laundry Files (whose volume one I missed, and whose subsequent volumes I've had to sit out), that can mean missing a decade or more's worth of critical attention from a reviewer who is otherwise very fond of your work and would do their best to sell it. This is, of course, also true of readers, but readers are not under quite the same pressure as reviewers to stay on top of current releases -- and that goes double for reviewers who are also novelists who write blurbs, which really turns the pressure up some more. Every book I go back and re-read for pleasure gobbles up time that I could be using to make a significant positive change in a colleague's professional life, so it's very hard to justify (I have no idea how Jo Walton does it). Stross finishes with a set of recommendations for anyone hoping to run one of these extraordinary marathons, which I commend to anyone contemplating any substantial fiction project. * The first couple of books should be stand-alone, or at least deliver plot closure for the readers, because it's possible the series will end early, for reasons beyond your control. * Don't even think about writing a series unless you're in love with it at a conceptual and character level, because if you get a working series off the ground, it will be with you for longer than the average marriage. As for writing two million-word series in parallel? That's just crazy. Or maybe it's polygamy. I'm not sure: I just wish I hadn't gotten over-ambitious in my thirties. * If the series doesn't end, you will burn out, probably several times, over the process of writing ten novels. Plan for it, and factor in taking years out to do something else while you get your mojo back. * You will become a different person while you work on your project, and this new you will be interested in different aspects of the story to the ones that held your attention in your youth. Give yourself permission to tear up and rewrite your series plan at will, otherwise you'll create a rod for your own back. If you haven't been through them yet, don't underestimate the impact of cognitive and other personality changes that will essentially turn you into a collaborator with your younger self.